Alex Kelly (Backward Education Society - BASE): Alex served in the Peace Corps in Costa Rica from 2007-2009 in the Children, Youth and Families Program. He then worked as the field operations manager for the Foundation for International Medical Relief of Children in El Salvador until July 2011. At the time of his fellowship, Alex was studying for a Masters degree at the School of Foreign Service, Georgetown University in the International Relations and Security concentration. 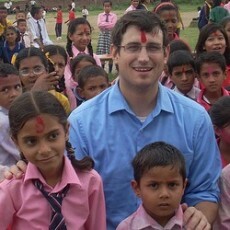 After his fellowship Adam wrote: "I enjoyed the chance to get know Nepal and Tulsipur. It was very helpful to see the problems affecting children in a part of the world that I had never been. The chances to go out into the field, as sparse as they were, were very instructive and enjoyable." For the Love of God can Someone Please Give her a HUG!! Child Clubs: is this Wall Street or Main Street? 6/20/012 I am not a numbers man. I hated algebra, geometry and all the rest. Wait we work on Sunday?